The Debra Corey interview on Christmas recognition- take two. Have you ever prepared for something only to find that when you get there it goes in a completely different direction? That’s exactly what happened to me when I appeared on CNBC’s Squawk Box TV show on the morning of Friday 11th December. The day before, Reward Gateway had released the results of a survey we conducted around rewards and recognition at Christmas - we asked employees how their company recognises them over Christmas, and whether they look forward to or dread the Christmas party. Why don’t employees want to go to their company Christmas parties? How should companies plan for their Christmas parties? Should companies hold Christmas parties if they are re-sizing? Is a Christmas gift better received than a party? Q: What does the research show? A: The research shows that approximately three in four companies are rewarding and recognising their employees this Christmas. They are doing it in very different ways, through Christmas parties, gifts, bonuses, time off, etc. All of this shows that there is no ‘one size fits all’ approach to reward and recognition, at Christmas or throughout the year. Exactly how it should be! Q: If it is done so differently how should companies decide what is the best thing to do for their employees at Christmas? A: The first thing that companies need to do, both at Christmas and throughout the year, is to develop their reward and recognition strategy. This strategy should fit with the company’s culture, values and business strategy, resulting in programmes which will get the best out of their employees and create a happy working environment. Once this is in place, companies can then decide what should be done at Christmas to align and support what they are doing throughout the year. Q: Your survey showed that 54% of employees are dreading the Christmas party, but yet it also shows that Christmas parties are the most common way companies are rewarding their employees at this time of year. 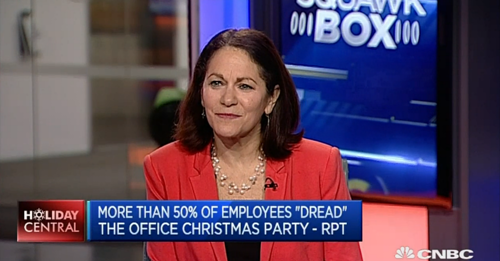 Does this mean that companies should not be holding Christmas parties? A: You are correct, 54% said they are dreading the party, but there are still the 46% that are looking forward to it In fact, 38% of employees aged 18 - 35 said that it was the highlight of the year to them. What this shows is that everyone is different - what one employee may think of as a treat, the other may dread. It’s fine to hold Christmas parties, but create something which will appeal to as many of your employees as possible. You can get it ‘right’ by understanding when, where and what they’d prefer. Consider your different employee groups, whether by age or function, and find ways to engage each of them. That being said, we need to accept the fact that there will always be people who dread parties, but I’d like to see that percentage decrease as more companies understand how best to create the ‘right’ party. Q: Finally, what do you think are the benefits of rewarding and recognising employees not just at Christmas, but throughout the year? A: Have you ever heard the phrase ‘dogs are not just for Christmas?’, well that is true of reward and recognition as well. If companies want to truly engage with their workforce, they need to engage throughout the year. What we’re seeing with our clients is exactly this, with an increasing focus on a long-term and ongoing approach to reward and recognition. Gone are the days of rewarding long service with the big Rolex watch; businesses are replacing this with strategies and programmes which create engagement 365 days a year. Companies will benefit in the long run because happy, engaged employees drive success by making better decisions (as they care more), being more productive (because they like or love what they are doing) and innovating more (because they want to succeed). Q: Debra, thank you so much for your time, you did such a fantastic job that we’d like you to come back every Friday for a regular spot on reward and employee engagement! A: OK, maybe it wouldn’t end that way, but hey . . . a girl can dream, can’t she?!! !